Here comes more boilerplate reporting on Obama’s reshuffling of the National Security deck. This New York Times reporter asserts with great certainty some conclusions that sound like they were hand-fed by the principals themselves. 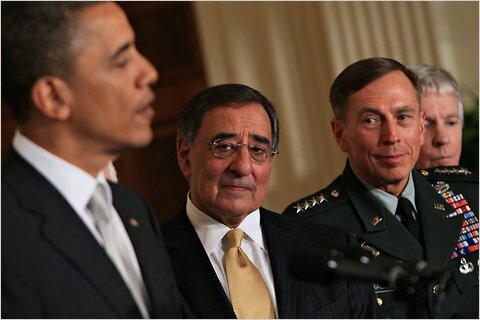 Mr. Panetta, 72, the C.I.A. director, previously served as director of the White House budget office and the House budget committee…Mr. Panetta has ties on both sides of Capitol Hill, where he served in Congress from California for eight terms, until he became President Bill Clinton’s first budget director in 1993. His expertise will serve him well as he faces $400 billion in national security cuts ordered by President Obama through the 2023 fiscal year, a bracing new reality after a decade of ever bigger Pentagon budgets since the Sept. 11 attacks. Mr. Panetta’s personality — approachable and jocular — is also expected to help in negotiations with Congress. OK, so, according to this version, the main thing the head of the Pentagon has to do is negotiate with Congress regarding those cuts. The reporter doesn’t say what exact role he will play, but presumably he has to convince military budget hawks that these cuts will not harm defense. Well, Panetta may be “approachable and jocular” and a skilled negotiator, but it’s hard to imagine that those qualities will make such a big difference in persuading military budget fans to accept cuts. You’d think a general would be more persuasive, actually seem to know what he’s talking about when he says there is fat to trim—and far better political cover for members of Congress who have to explain lost jobs in their Red-state districts. “Leon Panetta made a good argument”? Don’t think so. The only thing that comes to mind in that regard is all those infernal leaks, via Petraeus, and McChrystal, to Bob Woodward, that forced Obama’s hand on Afghanistan and in some ways, Iraq. Obama had no choice on the troop increase because of these pressures. For more on this see our articles here and here and here. Obama considers the military a problem for him personally, especially with an election approaching, and he needs his guy in place to keep things under control over there. No more damaging leaks. And he can’t count on real military guys to testify before Congress with a straight face that, shucks, it’s fine to cut their allowance. His C.I.A. job will also help him negotiate the military’s critical and frustrating relationship with Pakistan’s spy agency, the Directorate for Inter-Services Intelligence, which American officials say continues to play a double game and support both the United States and the Taliban in Afghanistan. As C.I.A. director, Mr. Panetta has met regularly with Lt. Gen. Ahmed Shuja Pasha, the head of the agency, a relationship he is certain to continue. Ok, take note of that. Negotiate the US military’s relationship with Pakistan’s spies…. Meanwhile, over at the Washington Post, several solid reporters there (but, significantly not the Pentagon’s favorite “inside guy” Bob Woodward) are focusing on the CIA-Pentagon swap-eroo. Why General Petraeus as CIA director? So, if this is right, paradoxically, Panetta can’t stay at CIA because he’s too civilian for the “civilian” agency turned military proxy. And Petraeus isn’t politically reliable enough to be Defense Secretary, so why not a brilliant crossing of sides, putting him at head of a spy agency that doesn’t do all that much spying but is hugely involved in just about everything else? Why a CIA-run bombing campaign? Some of this has to do with undeclared war over Pakistan. Can’t have the US military in there, because, well, because the US military can’t be bombing people in that country. The CIA, well, who actually knows what the CIA is supposed to do, or what it actually does? Certainly not Congress, perpetually in the dark, its leaders constantly misled in supposedly hush-hush briefings. So, the Post is making approximately the opposite point the Times makes. Here, it’s a problem that Petraeus will be bad at liaising with the Pakistanis. In the Times piece, it’s useful that Panetta will be good at that. Two sides of the eminently flippable military/CIA coin. Pay close attention. “…right guy..for the operational side…struggle (with) broader global responsibilities…” There’s that unspoken Truman worry—there never was supposed to be any operational side. Oh! Panetta’s path is a repeat of Gates’ path over the course of the two Bush presidencies. A loyalist moved from CIA to Pentagon, while expendable figures are put in charge at CIA. …Petraeus’s nomination triggered some grumbling among CIA veterans opposed to putting a career military officer in charge of an agency with a long tradition of civilian leadership. Aha! Walnut farm. Something in that, surely. Managing nuts? Tough nut to crack? By the way, for more on power struggles between entrenched internal forces, and the president–any president (and certainly Obama)—see this piece of ours.